I was really excited to pick up this book seeing as I loved the first one, which I read not so long ago! P.S. I rarely read the sequels back to back and usually don’t pick them up for quite some time after I’ve read the first book. I don’t why, it’s just what I do. But with this book I felt the need to immediately read more about the characters and get back to this world. I generally like action packed books, don’t get me wrong, but I also really like books with a slower pacing that just narrate daily problems and don’t have end-of-the-world catastrophes happening all the time. The problem with these books is that they tend to get boring, and if the characters and the writing is not good enough for me, I get tired of them pretty easily. That’s the thing I love most about the bloodlines series. It has this kind of comfortable pace and it sort of feels like strolling around in the streets on an autumn morning, if that makes any sense at all. It just felt really nice being in this world and hanging out with these characters. The characters are so perfectly described that I feel like I know each and every one of them. Like I would recognise them on the street and go catch up with them or something. No, seriously, Richelle Mead has done an excellent job creating those characters and making them seem like they’re real. Or well, as real Moroi, Dhampirs, Alchemists and so on can be. As far as the story goes, well, as I said it doesn’t have a very quick rhythm, but for me it was the perfect pace. The only thing I have a slight problem with is the relationship between Sydney and Adrian. If you’ve read the first book (spoiler alert if you haven’t! ), you know that practically nothing happens between them in the first book. Sydney doesn’t even realize that she likes him and there’s almost not a single “moment” between them. This sort of thing also continues in the second book with a little bit of progress of course, but not really much. Can’t say I expected anything more. It was clear from the first book that things were going to be slow, but I wish they were going a little bit faster. I’m so looking forward to seeing some “Sydrian” romance and kissing and whatnot! So, to sum up, I’m starting to become a huge fan of this series and hope I can get my hands on that third book really soon! Most people would find being led into an underground bunker on a stormy night scary. Well, after the cliffhanger at the end of the 1st book of the series, I couldn’t help but immediately start the sequel to that one. So Tally is pretty now… I expected that one, since it was actually revealed in the first book. I also expected her not to care about her brain being totally altered and damaged, but I didn’t expect that all of her memories would be as fuzzy as they were. 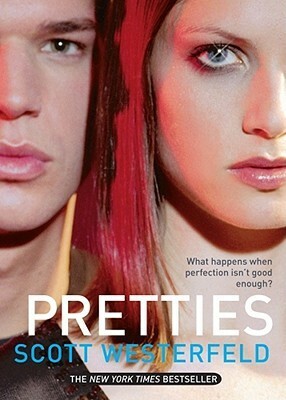 In the beginning of the book, Tally is acting almost exactly as every other pretty is in that messed up town of theirs. David is nowhere to be seen and Tally is pretty much left to fend for herself. As all the pretties are living their pretty lives and going to their pretty partys, Tally is starting to get closer to a certain guy, called Zane. He seems to be a bit different from the others, trying to make Tally somehow “wake up” from the haze that she’s into and be “bubbly”, and they start falling for each other. And that Ladies and Gentlemen is what we call a love triangle! I don’t generally hate love triangles. In fact if they’re well made I really like them. And in this case it was definitely well made and it actually had a reason for being there. All of Tally’s memories from when she was ugly are very unclear and she doesn’t think that all of those things are important anymore. So she definitely doesn’t feel a commitment or anything against David, which makes her free to start something new! And Zane is a really awesome guy! In a world were everyone is exactly the same, he stands out. Not much, but still… Even a little makes a difference here. What I really enjoyed about this book was that I now knew a lot of things about this world, which made me enjoy the story so much more! In the first book it took me a while to understand who were the rusties and the smokies, how was everything working and what the heck there was going on! The second book was not as complicated and I now understood this world and what was going on. The only reason I ended up giving this 4.5 stars was the ending. I’m not going to reveal anything, but it really pissed me off and I’m not looking forward for the rest of the series as much anymore. I really hope that the 3rd book is going to be good, just because the first book was great and I really want to like this series! Gorgeous. Fearless. Dangerous. They’re the kind of girls you envy; the kind of girls you want to hate. Strangers in town for the summer, Penn, Lexi and Thea have caught everyone’s attention—but it’s Gemma who’s attracted theirs. She’s the one they’ve chosen to be part of their group.Gemma seems to have it all—she’s carefree, pretty, and falling in love with Alex, the boy next door. He’s always been just a friend, but this summer they’ve taken their relationship to the next level, and now there’s no going back. Then one night, Gemma’s ordinary life changes forever. She’s taking a late night swim under the stars when she finds Penn, Lexi and Thea partying on the cove. They invite her to join them, and the next morning she wakes up on the beach feeling groggy and sick, knowing something is different.Suddenly Gemma is stronger, faster, and more beautiful than ever. But her new powers come with a terrifying price. And as she uncovers the truth, she’s is forced to choose between staying with those she loves—or entering a new world brimming with dark hungers and unimaginable secrets. Okay, let’s be honest here.. The basic – if not only reason I bought this book was because of it’s cover! 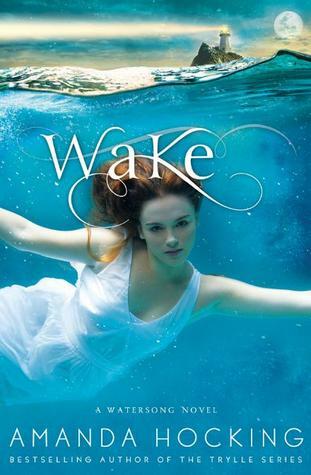 This is the first book in the watersong series, consisting by wake, lullaby, tidal and elegy. First thing I loved about this book was the relationship between Gemma and her sister, Harper. Harper is the big sister and since they are growing up without a mother, she has taken the role of taking care of her little sister. They have a love-hate relationship, since Harper is overproctively trying to control Gemma, but we can see that they care about each other deeply and would do anything for one another. 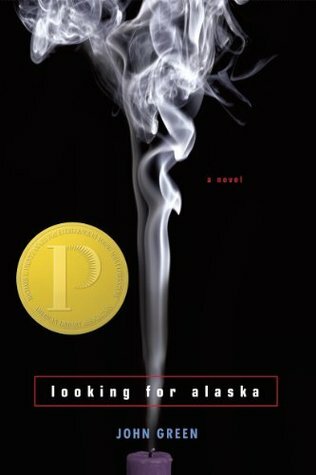 I enjoyed every character in the book, with Haper’s love interest being my favourite, even though he didn’t have that big of a part in the book. The point of view is switching between Gemma and Harper, which is done in a very smooth and nice way; I enjoyed reading both POVs! The pace of the book was somewhere in the middle I would say. In the beginning it was not very action packed, without being boring either. As the story continued it was becoming more and more intriguing, but was a bit too predictable for me, which is why it lost half a star. All in all, an excellent first book in a series I will definately continue with!